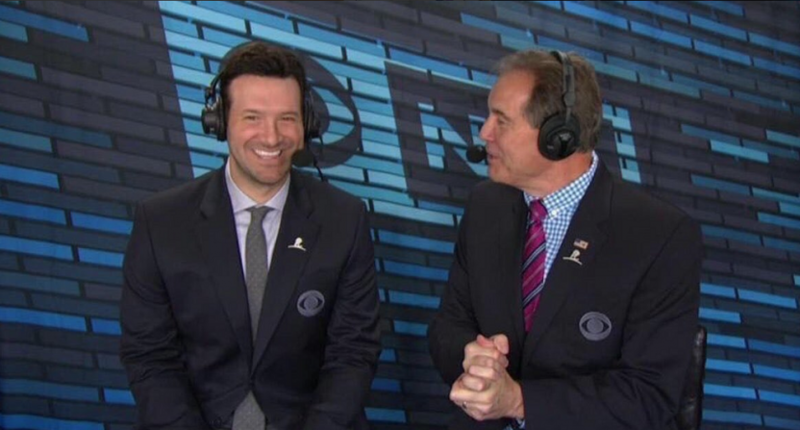 In 2017, Tony Romo drew plenty of praise for his first season as a color commentator with CBS, especially with his ability to see and call plays before they happen. And during Sunday night’s Patriots-Chiefs AFC Championship Game broadcast on CBS, the former quarterback put his clairvoyance on full display. The Chiefs could’ve really used Romo as their defensive coordinator, because he knew what the Patriots were going to do on many plays late in the fourth quarter and in overtime in New England’s 37-31 win. We’ll start with 3:50 remaining in regulation, when the Patriots trailed 21-17 and had 4th-and-inches at the Kansas City 10-yard line. Tom Brady’s known for being very good at the QB Sneak, and Patriots running back Rex Burkhead was stuffed on 4th-and-1 earlier in the game. So, the QB Sneak seemed like it had to be the call this time, and Romo said as much when New England approached the line. That’s exactly what happened. Rob Gronkowski went in motion to the right side of the line, and helped open up an outside running lane for Sony Michel, who went untouched for an easy touchdown. With 54 seconds left in the quarter, the Patriots trailed 28-24, and faced a 3rd-and-5 at the Kansas City 29-yard line. Brady indeed went to Gronkowski for a 25-yard completion. In overtime, the Patriots had 3rd-and-9 at their own 35-yard line. Brady hit Edelman over the middle of the field for a 20-yard gain. Later in the drive, the Patriots had the ball at the Chiefs’ 30-yard line on 3rd-and-10. Brady and Gronkowski connected for a crucial 15-yard play, on what would turn out to be the final pass of the game. Rex Burkhead then carried the ball into the end zone for the game-winning touchdown to put New England in the Super Bowl. I think @tonyromo just predicted correctly maybe the final 30 plays of this game? My god. That was an all-timer from the booth. I was going to watch True Detective, but Tony Romo just told me what happens. I mean, Tony Romo may be the most prescient, on-the-money analyst ever. We constantly kill everyone and their mom in my industry behind a microphone in a booth and it's time we actually salute a guy who is as good as they come and as good as there ever was. The Patriots-Rams Super Bowl is shown on CBS on Feb. 3, so we’ll get to see and hear more of Romo’s brilliance in two weeks.